Brendan Walker, thrill engineer and Coast presenter, works with the latest technology on the thrill rides he creates for clients as diverse as Alton Towers and the Tate Modern, but he also draws on some of the oldest traditions of the fairground. He explains his theory of thrill and the technology he's currently working with. You’ve been described by The Times as the world’s only thrill engineer. What does that involve? "In terms of engineering thrill I'm interested in the design of something very subjective - emotional experience - but I'm also drawing on my engineering background to look at ways in which to build these experiences. So, in a sense, on a practical level, I am a designer of emotional experience but with heavy elements of artistry, objective analysis and construction - that’s where the engineering and thrill come together." What was your path to such an incredibly cool job? "I originally trained as an aeronautical engineer working on military aircraft in British Aerospace. Then I wanted to become an industrial designer so I studied an art and design foundation course to get into the Royal College of Art. I went there wanting to design white goods and came out making pirate radio stations. But while there I became very interested in the way technology could enable changes in social dynamics and so I joined the college's interaction design research group. Meanwhile, I also started my own private practice making electro-mechanical installations for art galleries and science museums. It was in the making of those very large mechanical installations that I realised people were becoming excited by what I had made, so there was a sort of performance element to it. I didn't know enough about that kind of highly charged emotional experience so I spent a year on the Chromo11 Engineering The Thrill research project, interviewing people about their thrilling experiences and creating a Taxonomy of Thrill. I coined what became known as the Walker Thrill Factor which links measurable physiological traits of arousal and pleasure to thrill. I realised that I could monitor people in a technological loop and create interactive artwork and, over the last ten years, that has become something of a trademark. As a thrill engineer I have an understanding of what thrills people, how we can monitor it and can then design new experiences to elicit tightly choreographed thrilling experiences." One way in which you have done that is with Neurosis - a virtual reality fairground ride that reads passengers’ minds. What happened to the people who went on that ride? "Neurosis is a brain-controlled thrill ride. It was commissioned by FutureFest and their remit was: we’ve got 5,000 people coming to the Southbank over a weekend and we need a spectacle with the theme "the future of entertainment". 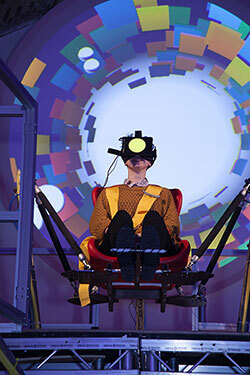 I took the things I was interested in - virtual reality, motion simulation, brain monitoring - and I created a ride where riders were taken up onto a three-metre high, six degree of motion platform facing an audience of about 200 people. There was a gate open in front of them so they could physically fall three metres - meaning that they not only had the anxiety of performing to a crowd but also the real physical jeopardy of falling from height. They were strapped into the ride, an Oculous Rift headset was put over their eyes, and a brain monitoring cap was fitted. They then saw a tunnel emerging in front of them in virtual space which was generated by the 14 channels of brain data I was collecting. That brain data was interpreted using various algorithms to create the world they were experiencing and, as they went tumbling and falling through this world, the motion platform kicked in to give them a sense of falling through the tunnel. I also worked on the brain data with another artist to create a neurogenerative sound track – some kicking bhangra-style music with parameters controlled by the brain data. The ride lasted for three minutes and, in the middle, the riders were instructed to concentrate and to think about going forward. By doing this they were able to train the ride: if they were successful in concentrating then their trajectory through the tunnel would become more stable and the ride experience smoother." I’m feeling ill just listening to that! What are the ethics around it? Are you worried about pushing the human mind too far in this kind of thrill seeking? "It is interesting. With the University of Nottingham, I wrote a paper, Uncomfortable Interactions, that talked about the ethics of my work because it's very much about pushing the boundaries and putting people in awkward social situations. I see it as being a bit like the kind of unwritten contract you have when you walk through the doors to a theme park. We go to those places for novelty, to be surprised. That is how and where we get our thrills and if we had too much control – if we knew we could stop the ride and get off - then that relationship breaks down. That’s how I think of my installations - it’s framed as entertainment, but we do internally assess what might actually be going on, and evaluate the possible consequences. For example, the worst thing that might have happened on Neurosis was people having a bout of vertigo, so there were lots of safeguards in place, all built into the performance. I take great care of my riders, particularly when it’s something novel, but I never make them realise that there is such a large amount of care happening. That’s the trick." Do you see this as the future of thrill rides? It seems we’ve gone as far physically as we can go - you can’t drop people any further or turn them any faster - so are virtual reality and brain monitoring now the way forward? 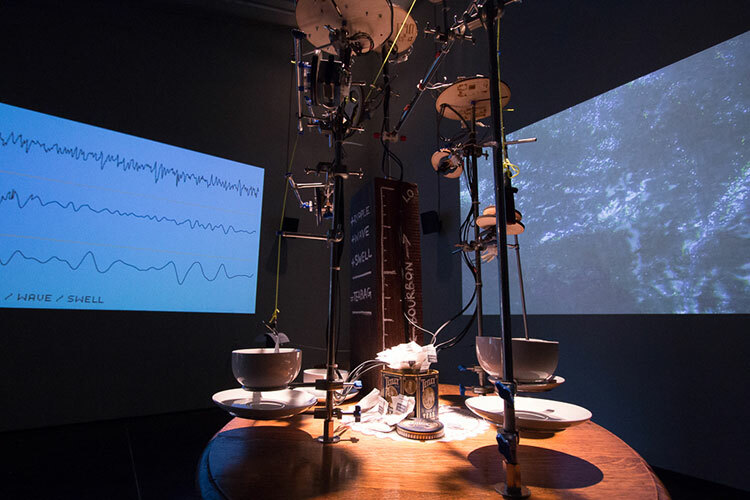 "One of the successes of Neurosis was that, like lots of rides that have appeared over the last 100 years, I was presenting the trends and intrigue in current scientific frontiers – in this case, neurological monitoring. That was part of the thrill for the audience. If, in two years’ time, we find that mind-expanding biochemicals are currently popular in the public’s mind, then I will probably be making rides based around that emerging technology. So that’s why I’m constantly looking at trends in engineering and technology. Taking a historical perspective, one of the first places that people experienced electricity was at fairgrounds - most people had never seen a light bulb before they went to a fairground. Historically, they have been places where the public have been allowed to experience emerging scientific and technological advancements before they get brought into popular everyday life. That’s the relationship I’m interested in. With Neurosis I spotted that the most interesting thing for me was the moment of putting on the virtual reality mask and taking it off – that movement between being in a real world in the presence of an audience and then being immersed in a very insular solitary experience. Both of them have very different social dynamics and the movement between the two creates the thrill. So the next ride I made was Oscillate, which was a very simple swing with a virtual reality experience attached to it but it played much more on that relationship between the individual experience and the spectator experience. I’m driven by watching and observing and creating emotional experience and if technology can help me then great." What new technology is exciting you at the moment? "Most of my conversations at the moment are around virtual experiences and while we wait for companies like PlayStation or Red Bull to start creating channels of virtual reality (VR) content, no one is entirely sure what that piece of technology will facilitate or support, whether it’s art works, whether its entertainment experiences. I think VR will intrigue me for another couple of years." Can you see a role for VR in education? "Whether because of its novelty or because it’s a medium that kids will become familiar with and will happily adopt because it’s the language of computer gaming, of entertainment and of TV, it will become the preferred way to consume and interact with information. So yes, I think if the technology becomes pervasive and deeply ingrained in other areas of a child’s life then I think VR will be exactly the right platform for education." To what extent do you rely on the power of the Janet Network for your work? "I made a piece of work last year called Storm In A Teacup, commissioned by Hastings Pier Charity. It relied on sensors to monitor waves in Hastings, sending data over the web to servers on the Janet network, which were used to analyse and visualise the data, to be viewed by the public in real time. This kind of creative use of distributed sensors and servers is central to many pieces of my digital artwork. I choose to work with the university's servers on Janet for their power and dependability." What are you hoping the Networkshop delegates are going to take away from your talk? "I am going to showcase some of the thrilling experiences that I’ve made and some of the work that I’ve made that relies on large networks - some are local area networks and some are distributed networks. I really want to show how my knowledge of being able to use those networks creatively has enabled these innovative experiences to evolve. I can use the idea of networking in a very fluid way, so that they almost become a material in itself that we can configure, reconfigure, put things in, move data around, treat things in unusual ways - it’s having absolute flexibility, reliability, and access to that kind of network that enables the kind of work that I do. So, my message is, be flexible, be accessible and great things will happen." Networkshop is our annual network and technology event. Networkshop44 takes place between 22-24 March 2016 at the University of Manchester. 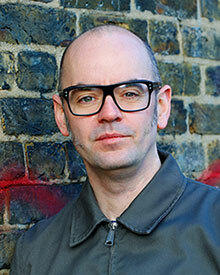 Brendan will be speaking at the Networkshop44 conference dinner on Wednesday 23 March. Find out more, including how you can join online, via the event web pages.